“Norbert the Dragon” Celtic Keepsake Chest –set includes one of Norbert’s treasures….a goldtone cross pendant! The lore of the dragon to be an evil and maleficent beast has been perpetuated through history since the dawn of Christianity. However before this time, these mythical winged creatures were believed to be sacred with beneficial powers over the heavens and the purser of seasons…. A sort of “Watch Keeper of the Realm” so to speak. This is the saga of Little “Norbert the Dragon”, a hatchling of the northlands, alone on a rocky Celtic Isle, whose fate was changed forever when found by a young maiden who brought him home where he was nourished and loved. Since Norbert was a very small dragon he made himself at home in unusual places such as jars, pots, and even shoes and it was all very cute. Unfortunately not all of those encountered found him so charming, and as with all “youngsters”, the testing of new skills (even in small scale) had occasion to go awry. There was the incident of the “hot foot” when a foot was inserted in an “occupied shoe” and the “splashdown” in a cauldron of soup while testing the rules of aerodynamics! Oh and let’s not forget that Norbert was attracted to sparkly things and anything shiny like gold and silver! Unfortunately he also liked to “find” pretty objects unattended on his daily exploration about town and bring them home. Although he meant no harm and everyone knew where to come to retrieve their trinkets, it was still annoying and soon little Norbert was banned from the home for his misdeeds. The young girl could not bear to lose her beloved Norbert, so she secretly placed him in a small box in her room to keep him safe. Norbert missed the outside so when night fell and all the village was asleep, Norbert the Dragon would hop out of his box and take excursions about the land to further his new found skills and keep watch on the town. Now, this was a time of good and evil and on one cold dark night while everyone slept, a band of pillagers came to ransack the village, grabbing all what was precious. The only one on guard was Norbert, and he knew he had to protect his family and his town. But what could a small dragon do? Not much, unless you were a dragon with a big heart! So Norbert silently flew up behind each plunderer and with all his might gave each “A Breath of Hot Air”… igniting their clothes. Luckily he was so small and fast, their weapons could not reach him. They ran off to the coast with their britches ablaze, their screams awakening the town who then found Norbert proudly seated upon the loot the thieves left behind! Norbert the little Dragon had saved the town! So of course he received a welcome home and was rewarded by the villagers who presented him with a brand new place to rest and keep his little treasures! A beautiful chest decorated with his likeness and artistry of Celtic knot work. He was also given a new item for his collection …a small golden cross to thank him for his bravery! So now Norbert is beloved by ALL and proudly perches upon his very own keepsake chest which he protects very well! Now you too can possess your own little Norbert upon his Dragon Keepsake Chest. Each chest is exquisitely crafted of cold cast resin and stands 7”H (with lid closed) x 6-1/2” L and 4-1/4” W at sides. Washed in a darkened grey stone patina simulating the look of weathered stone of the coastline, the intricate artistry of Celtic knot work abounds. 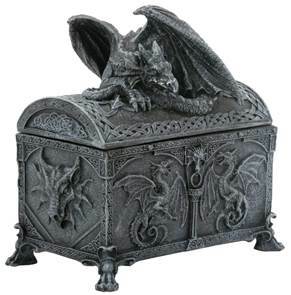 Dragon reliefs adorn each side of this chest….all in the likeness of our beloved dragon….Norbert! Inside is the perfect place to stash your very own 1-1/2” high Gold-tone Medieval Cross Pendant on black cord, as was presented to Norbert for his heroism! Wear it proudly and stash it within your Chest at night as this little dragon will always be “on guard” to keep your treasures safe. This is a special limited supply item! So if you love mischievous little dragons with a big heart or know someone who does…. Get yours today, before “Norbert the Dragon” Celtic Keepsake Chest and gold-tone cross pendant will only be a fond memory! #6549 $45.00 for both Chest and Pendant.